Insane Slow Cooker Pork Carnitas are packed with flavor and easy to make! Insanely delicious pork carnitas slow cooked with beer, smokey chipotles, and spices until it’s so juicy and tender, it just falls apart. Lightly shredded with a fork, it’s the perfect carnitas for any Mexican dish. I truly mean that. I’ve used this recipe for tacos, nachos, burritos, quesadillas, and salads. It’s an official family favorite. Even my picky red headed 5 year old will eat it up. I first fell in love with carnitas, which simply means ‘little meats’ in Mexican cuisine, when a good friend of mine took me to Cherokee Street in downtown St. Louis for lunch. I had been complaining about not being able to get real Mexican food. How little I knew. Sometimes, it’s just about who you know and where you go. Thanks Mare for the introduction! Cherokee Street is a really colorful part of town. And I mean downtown. Like downtown St. Louis where you think twice about going after dark. The thriving Mexican culture is totally worth it though. In addition to many small, authentic Mexican restaurants, there is an amazing bakery, small grocery stores, and so much more. My first visit was a truly eye opening and inspiring experience. 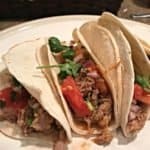 I tried tripe, cow tongue, pork, and beef tacos. All were delicious! We were also brought 2 amazing salsas with our meal. The American version for me and the authentic version, much spicier, for my friend. When I left Cherokee street, I went home with salsa like I had never had before, a to-go cup of horchata (creamy, slightly sweet, cinnamon infused drink served over ice), a dozen fresh, homemade tamales, and a whole box of treats from the bakery including apple stuffed churros which were the unanimous favorite. Which brings me back to the frequently made pork carnitas and always reminds me of that day. Start by cubing a boneless pork shoulder. 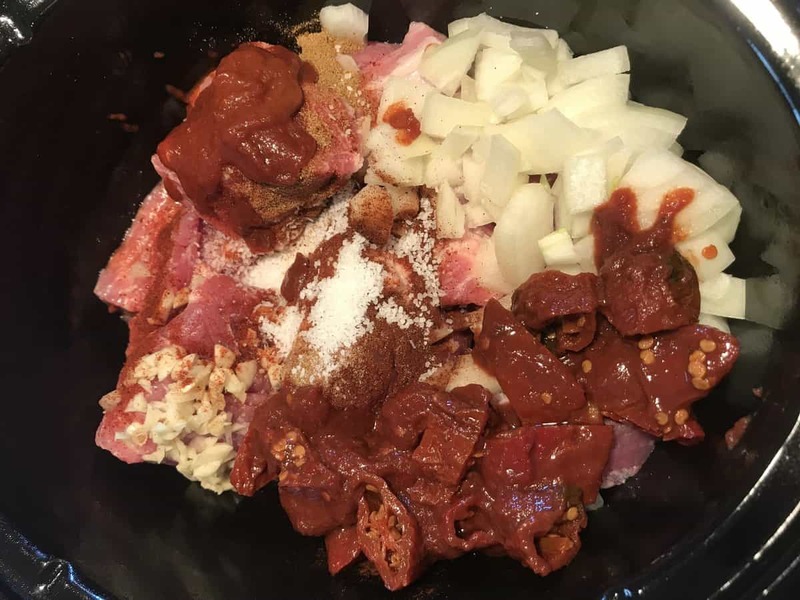 Add the spices, onion, minced garlic, the beer or stock, and the can of chipotles in adobo sauce to your slow cooker. Stir and cook 4-5 hours on high or 8-9 hours on low. Use 2 forks and lightly shred the pork. Use in tacos, burritos, salad, quesadillas, stuffed green peppers, chili, or anything else you would like. 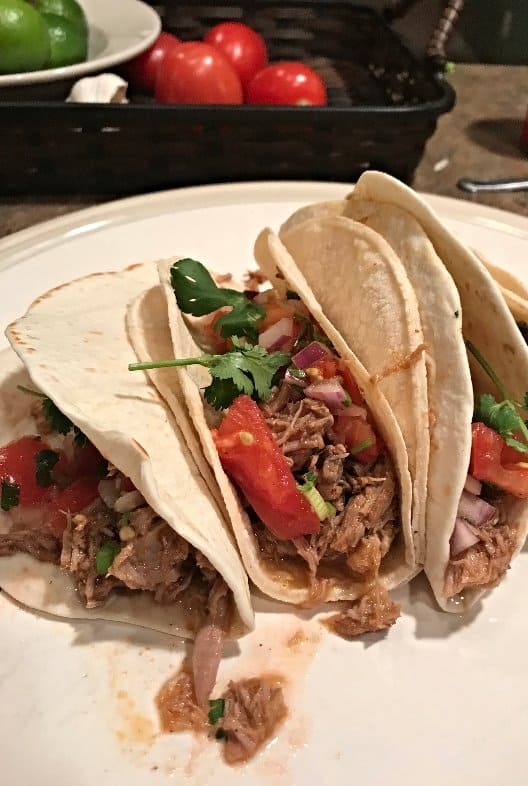 My Insane Slow Cooker Pork Carnitas are seriously that easy and so incredibly tender and delicious. Enjoy! 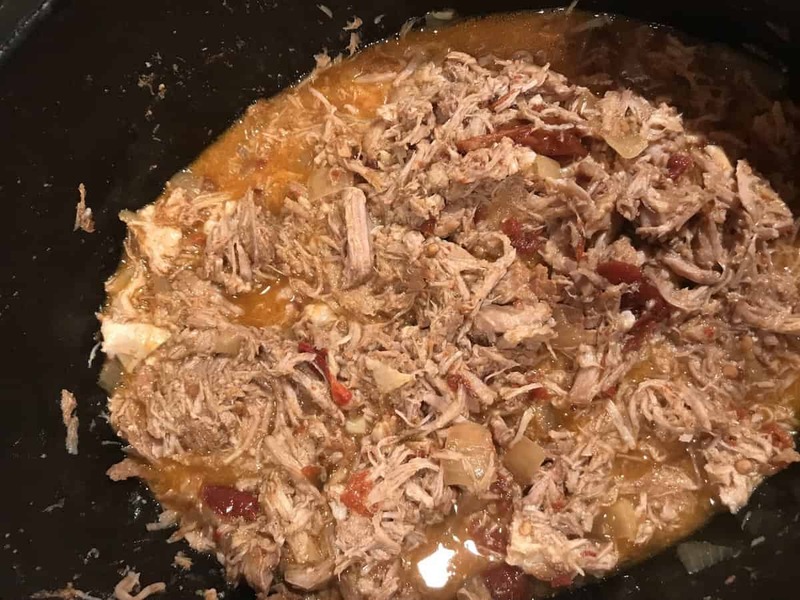 Insanely delicious pork slow cooked with beer, smokey chipotles, and spices until it's so juicy and tender, it just falls apart. Add pork, spices, garlic, onion, and beer or stock. Cook 4-5 hours on high or 8-9 hours on low. Remove excess liquid if necessary. Shred lightly with 2 forks.